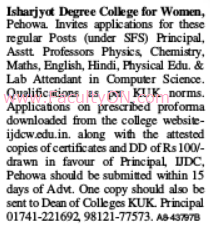 Isharjyot Degree College for Women, Pehowa has advertised in the TRIBUNE newspaper for recruitment of Assistant Professor jobs / Principal / Lab Attendant job vacancies. Interested and eligible job aspirants are requested to apply within 15 days from 29th September 2018. Check out further more details below. About College: The college is located on Urnai Road at a distance of about 1 km from the bus stand on the outskirts of Pehowa town. It is housed in a well planned and magnificent building having most hygienic and pollution free environment. How to Apply: Interested and eligible candidates are requested to send application filled in prescribed format downloaded from college website along with attested copies of certificates / testimonials and application fee DD of Rs.100 to the postal address provided here.